The certificate’s private key could not be accessed. Parser Error Message: ID1024: The configuration property value is not valid. Error: ID1039: The certificate's private key could not be accessed. Ensure the access control list (ACL) on the certificate's private key grants access to the application pool user. After redeploying one of our IIS applications, we suddenly started getting this error message. We verified that the fingerprint matched the expected certificate and that the Application Pool setting “Load User Profile” was set to true. The fix was to allow the AppPool user (NETWORK SERVICE) to read the certificate private key). Open the MMC snap-in by running mmc.exe. Select File -> Add/remove snap-in. Select Certificates and click “Add”. Select “Computer Account”. Click Finish. Click Next. Drill down to Personal -> Certificates. Right-click your certificate and select All Tasks -> Manage private keys. Add NETWORK SERVICE and give it “read” privileges. Run Sysprep on the existing Windows Server 2008 to clear out any unique info such as IP address and hostname that might cause interference later. Check “Generalize” and select “Shut Down” from the drop down. where --original is the name of the virtual machine to be cloned (You can get the list of names by running virsh list --all), --name is the name of the new virtual machine and --file is clone image to be created. Start the clones and give them computer names and IP addresses. I found myself in an odd predicament earlier when I couldn’t get the IIS Manager on one of our Windows Server 2008 R2 boxes to open. When I tried to open it, the IIS icon showed in the taskbar but clicking on it had no effect. I tried just about everything to restore it, even restarting the box to no avail. The fix for me was to run Inetmgr.exe /reset which resets your IIS preferences, including window size and placement. OCS Inventory is an inventory management system that can keep track of the machines connected to the network. It also features a package deployment system that can be used to run commands, install programs or copy files to the machines in the network. There are a number of guides out there on how to set up the deployment system, but the problem I had is that they all tell you to copy your cacert.pem file in the “OCS Inventory Agent installation directory”. I thought that should be /etc/ocsinventory-agent/ but it’s not. The directory where you should put it actually depends on the hostname of the OCS Inventory Server. Lets assume that my server is called “jones” and that I would access the control panel at http://jones/ocsreports. Then the location where I should copy the cacert.pem file on the computers running the OCS Agent would be /var/lib/ocsinventory-agent/http:__jones_ocsinventory/cacert.pem". The link redirects to the site, http://ie6countdown.com, which shows a map of estimated IE6 usage by country and announces the company’s goal to reduce the browser share of IE6 from 12% to 1%. From the map, it appears that the worst IE6 offender is China with 34% of Internet traffic coming from the browser compared with the United States’ meager 2.9%. For anyone whose ever worked in web development, the demise of IE6 can’t come soon enough. Intel’s newest chips include a new AES hardware acceleration feature. My favorite cross-platform encryption utility, TrueCrypt, recently added support for the new instructions (Turn it on in Setting->Performance in Windows or Settings->Preferences->Performance in Linux). 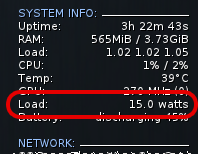 However, I noticed something interesting when comparing the benchmark performance in Windows 7 to that in Linux. 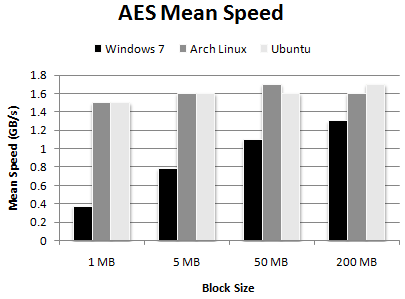 It seems that Linux is significantly faster than Windows, even though the acceleration is hardware-based. Each data point represents the average of three (3) runs. 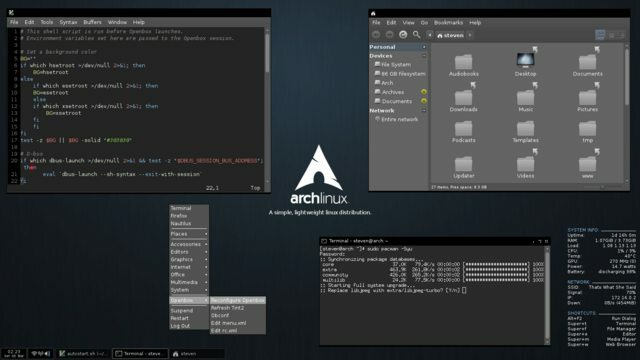 The operating systems used were Windows 7 Professional 64-bit, Arch Linux 64-bit (latest) and Ubuntu 10.10 64-bit. Tests were performed on a ThinkPad T510 with an Intel Core i5 M 560 processor and 4 GB of memory. Bottom line: If you plan to do a lot of encryption, Linux will give you noticeably better performance, assuming all your data is already in memory.